Hi! 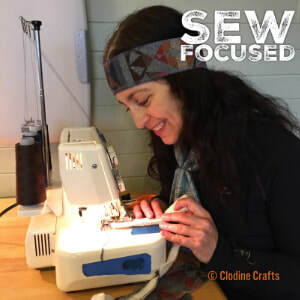 I'm Clodine of Clodine Crafts in Portland, Oregon. I design travel, commuting and lifestyle accessories for men and women - including for their bikes, boots, devices, drinkware, and more! The majority of my goods are made with Pendleton® Fabric. Why? Because I'm a fan of the excellent quality and designs of these iconic fabrics. Plus, I'm lucky to live within a comfortable bike ride of a fantastic Pendleton® Woolen Mill Store. There, I buy first-quality fabrics, as well as remnants and trimmings direct from the mill. For me, it is fun to mix media and eras in compelling combinations, or to create a unique take on a current trend. The inventive Belt Clip Strap in ID/Key Holders has a heavy-duty, stainless steel claw hook; a light but sturdy wool or denim strap takes the place of a heavy chain. My all-original Boot Cuffs combine wool or denim with lace trim and leather-like ties. I also enjoy devising ways to up-cycle materials I collect (from scraps direct from the fabric mill to vintage notions.) As you browse, you'll notice that the intersection of aesthetic with function deeply fascinates me. For instance, the large Wrap/Shawl is reversible, pre-shrunk, comes with a vintage wooden kilt pin, and can also serve as a table runner. Headbands and Biking Ankle Bands are both reversible, too, to accommodate how patterns have a stronger/softer expression from one side to the other. In addition, the Biking Ankle Band can double as a yoga mat holder. From unique Bike Top Bar Covers (weather-worthy and fit most any bike), to a variety of ID/Key Holders (which include Lanyards with breakaway safety clips and a retractable ID holder) the personal needs and fashion sense of the funky-elegant individual are well tended. How did this endeavor start? One day, I stopped by a local Pendleton® store that receives scraps directly from the mill; the next, I started collecting (stockpiling?) and experimenting - so much so (or sew) that I taught myself how to use the serger type of sewing machine. 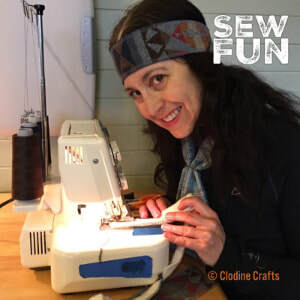 First, I created the wide, reversible Headband (especially good for running or wearing under a bike helmet); I made these for myself for my own commute, and for loved ones. Next, the Biking Ankle Band, and a custom Lanyard for a work ID. Then... my clever husband requested a Top Bar Cover for his bicycle. More custom work and some craft fairs later, the creative ideas continue to flow. If you have any questions or special requests or needs, feel free to contact me. Custom and wholesale orders welcome.